Handlebar adapter Caddy is a version of the KLICKfix handlebar adapter. For mounting on vertical tubes such as stems or seat posts. Suitable for foldable bikes, scooters, wheel chairs, golf caddys etc. Robust body made of glass fiber reinforced poly amide. Fits all tube diameters Ø 22-36mm. 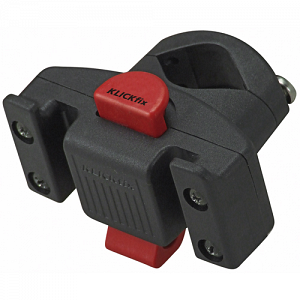 All accessories for KLICKfix handlebar adapter can be used on handlebar adapter Caddy as well.